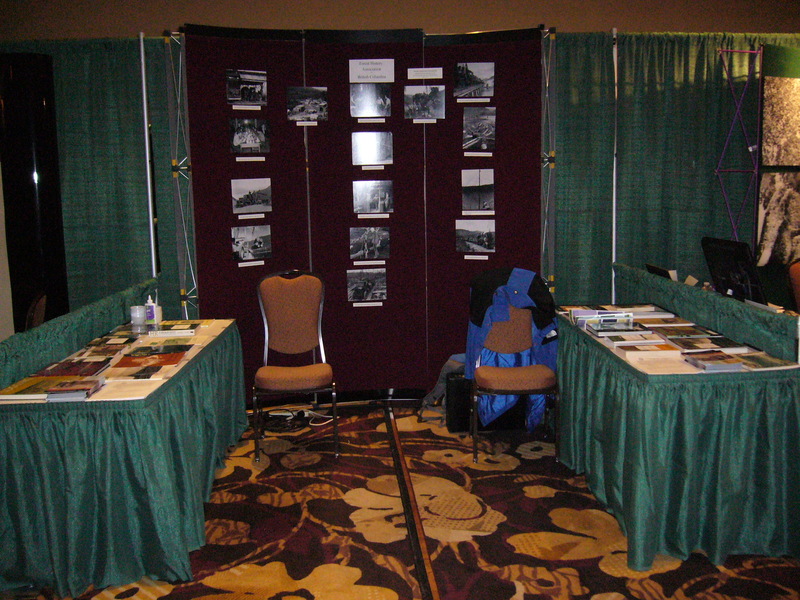 Forest History Association of BC booth at the Association of BC Forest Professionals meeting, 2014. Back in the spring I visited the Association of BC Forest Professionals meeting, in Kelowna. I had the pleasure of travelling there from Vancouver with Stan Chester, President of the Forest History Association of British Columbia. Over three days I stood in the trade-show area making contact with potential owners of forest history primary sources, with a view to encouraging their donation to local archives. Conference organizers were inviting and very keen for my presence (or, at least that of the Canadian Forest History Preservation Project!). They were kind enough to include a short blurb about the project in one of their “eBlasts” prior to the meeting, and to my surprise they described the Forest History booth as one of the reasons to attend to conference. This was, in part, because I promised to run an “Antiques Roadshow” service. I was not offering to appraise the financial value of anything. Rather, I wanted to be there to assist their membership in solving historical mysteries (When was this picture taken? Where was it from?…), and telling their own forest histories through the photos, documents, etc, that they may have brought from home, to share with others at the booth. Many people stopped by the booth with stories to tell, rather than objects to share. Others were attracted to the selection of gorgeous photo reproductions from the Wilmer Gold collection, courtesy of the Kaatza Station Museum and Archives, that Stan and I posted on our booth’s back wall. Still others wanted to browse through the collection of books from Stan’s private library that we scattered on the tables to either side of the display space. Booth visitor Fred von Westarp, of Powell River, put me in touch with his former employers in Nova Scotia, regarding possible material associated with the now closed Mersey Bowater office. Through correspondence with his former colleagues in Halifax, we learned that all photographs from that unit had already been transferred to the Nova Scotia provincial forestry division. However, this initial contact was still helpful because the Nova Scotia registered professional forester’s association distributed a short blurb about the project on their list-serve. Of the entire event my most promising lead for future a archival donation came from a significant corporate entity. Since then I have cultivated that relationship. At that time they wrote of this project, “What you provide is an opportunity to let go of valuable information – that has no place/space in current operations – into safe, appreciative hands.” Watch this venue for a future announcement of details on that donation. I will post more news once the papers have been signed. The Canadian Forest History Preservation project is a collaboration of NiCHE, the Canadian Forest Service, and the Forest History Association of British Columbia. Please help distribute our project brochures (English, and French), and assist us in finding records in danger of loss or destruction. Pingback: Archival Donation – Western Forest Products.